Co-founders of the Georgetown University School of Medicine (GUSOM) Random Acts of Kindness (RAK) Club (from left): Tamir Sholklapper (M'21), Sydney Karnovsky (M'21) and Zachary Tanenbaum (M'21). 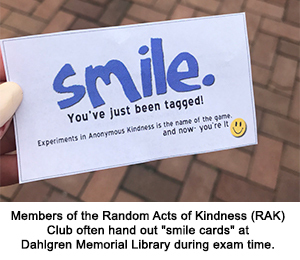 (September 8, 2018) — While most students set out for the library to study during finals, members of the Random Acts of Kindness (RAK) Club at the Georgetown University School of Medicine (GUSOM) head to the library for an entirely different reason — to hand out candy and compliments. “We line up a lot of our events during times when the student population is the most stressed. 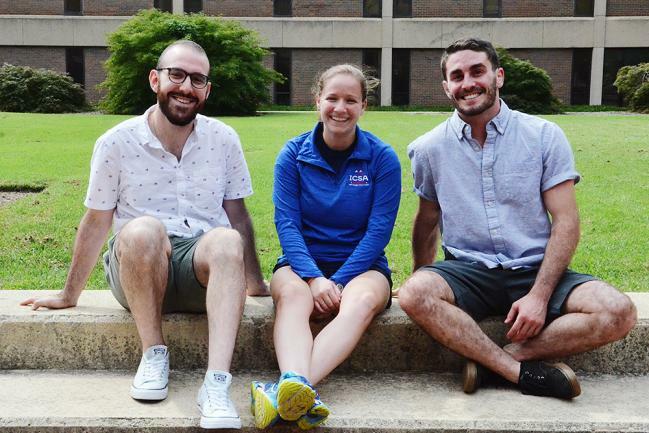 When there’s an atmosphere on campus that’s anxious, like during exams,” said Zachary Tanenbaum (M’21), a co-founder of the new club along with Sydney Karnovsky (M’21) and Tamir Sholklapper (M’21). Sholklapper had started a RAK club in both high school and in college at UCLA. Given the stress that comes with medical school, he knew it would be beneficial to start one on the Hilltop too. “In college, there were a lot of people stressed out and it was so simple to give people compliments and candy. The three of us were talking about how contagious happiness can be, and [the idea for a GUSOM RAK Club] started from there,” said Sholklapper. Karnovsky also emphasized how seamless the process was to get the club started at Georgetown. To date, the GUSOM RAK Club has handed out candy-grams for Valentine’s Day, raised money with baked goods for the St. Baldrick’s Foundation and given compliments, candy and “smile cards” during exams. What is a smile card, exactly? “They’re cards that have a positive quote on them and say: ‘Smile. Hope you have a great day. Pass it along,’” said Sholklapper. His hope is not only that the smile cards will brighten someone’s day, but also that they will catch on among the students themselves. Karnovsky also hopes that random acts of kindness will contribute to overall wellness on campus. “I hope it makes an impact on people’s day-to-day lives. That it gives them a second to stop, take a moment, de-stress and realize that there’s more to life outside of work,” she said. When asked how they’ve managed to balance medical school and starting the RAK Club, the three co-founders shared a similar sentiment. It’s fun and refreshing because it’s “completely different from academics or medicine,” and it helps to uplift their peers. The 2018-2019 academic year will be the first full year of the RAK Club, and the group has already expanded to a total of 80 people as of the student activities fair on August 24. “We’re getting more and more of a response with each event we do. It started out small with the three of us and some of our friends,” said Karnovsky. In less than a year, the RAK Club has made an impact with the activities they started last spring. However, with new members joining, they hope to host even more events in the future. “For me, the biggest thing would be having more regular RAK events. If there was a way to get a couple people to have a positivity event every other week — something that could happen on a regular basis — I think that would be the dream and what we’re building toward,” said Sholklapper. Want to get involved with the RAK Club?